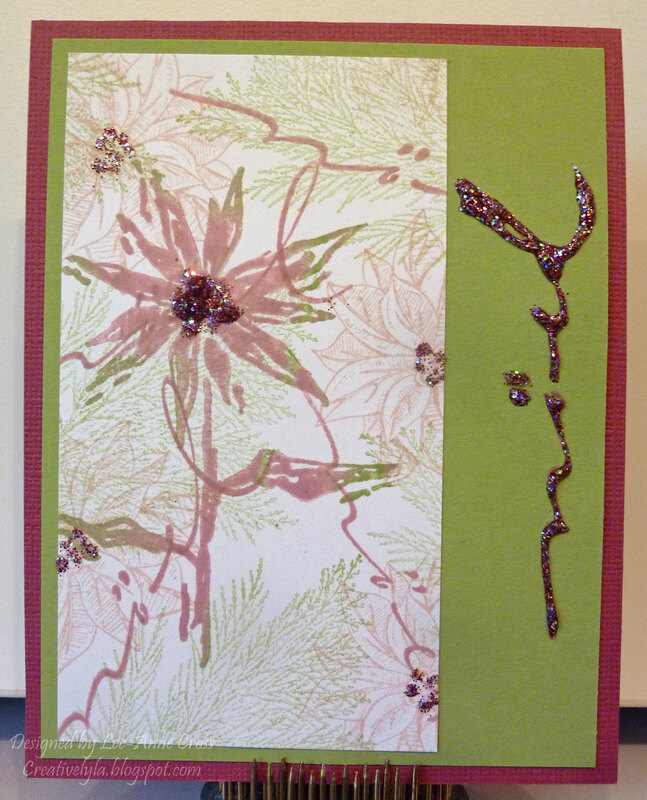 Another card headed to the MD Anderson Clinic as part of Splitcoast’s Hope You Can Cling To card drive. Today, our challenge is to create a collage. Honestly, I have a little trouble distinguishing between a collage and making your own designer paper. What do you think defines a collage? I’ve stamped four different images in three different inks. When the bough branch was stamped, it was stamped off twice first to get a much lighter shade of green. The focal image was done with a rock ‘n roll technique. First it was stamped in the Tattered Rose and then I rocked the Pear Pizzazz ink pad around the edges before stamping. Then I added some Stickles to the centers of the poinsettias. Next, the panel was trimmed down to fit my layout. The same sentiment image was stamped down the side of the green card stock and then outlined with the Stickles for a little more bling.